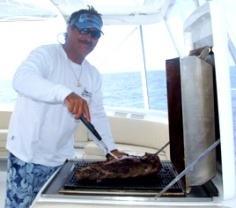 Rod Windley, owner of The Gulf Rascal, a 68' Hatteras, wears many hats. But, one of his biggest loves is sports fishing - especially in the Virgin Islands. "I love Venezuela and the Dominican Republic is really nice, but there is nothing like being in the Saddle on the North Drop - that's my favorite," he says. Growing up, Windley fished both on the Gulf Coast off Pensacola, Florida, and off the Outer Banks of North Carolina. "Family vacations were always centered on fishing," he says. 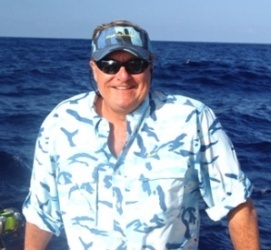 In the late 1970s, Windley caught his first billfish. "I've been hooked ever since," he says. 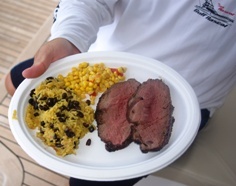 "Blue marlin are my favorite. They're at the top of the food chain." He adds, "In the Gulf, we always use drag and snag. However, I love raising fish on teasers and using a pitch bait. Bait and switch is the only way to go. I also prefer 30 pound line test as it gives the fish more of an advantage - especially if it's a pretty good size fish." 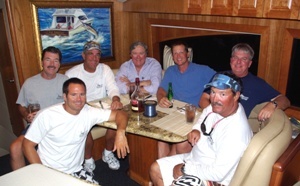 Windley, aboard The Gulf Rascal, regularly competes in a couple of tournaments each year. There's the Spanish Main Series, which includes the La Guaira Shootout and the USVI Open/Atlantic Blue Marlin Tournament or 'Boy Scout Tournament', and also the July Open Billfish Tournament in St. Thomas and the A.H. Riise BVI Billfish Tournament in the British Virgin Islands. His favorite is the Boy Scout. "It's the World Series of Marlin fishing and it's great to catch up with old friends," he says. 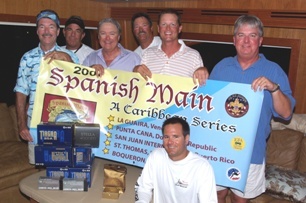 Team Gulf Rascal won the second leg of the 2008 Spanish Main Series, fished out of Punta Cana, in the Dominican Republic, with the release of seven white marlin. "I fish with the same team in all of the tournaments, Doug Caddell, Phillip Napier and Andy Venable; we are all close friends," he says. Capt. Billy Borer drives the vessel now, but in the past Windley has enjoyed fishing with several charter captains as well as Capt. Randy Jendersee on the Free Enterprise. "Fishing in the Gulf or the Bahamas is usually with customers," he says. Customers come from the multifaceted world of Windley's business life. He is vice chairman of healthcare company, Gentiva, and serves on several other boards both private and non-profit. He also co-owns Gulf Coast Hatteras in Orange Beach, Alabama, authorized Hatteras, Albemerle, Cabo and Grand Banks dealer from Apalachicola to the Texas coast. Finally, he's also in the real estate development business. "We are currently building a 62-slip marina, yacht club, restaurant and bar on Pensacola Beach called The Grand Marlin," he says. "The theme of the entire complex is all about sport fishing when the sport was coming into prominence in the 40's and 50's." As far as best days, Windley says, "We've had great days on the North Drop when we would get easily 8 or ten shots a day, but fishing in Venezuela when you get 15 to 20 shots per day is a blast." His best fish story, though, is about the one that got away. "In the early eighties, I was fishing out of Farjado, Puerto Rico and hooked a large blue marlin of about 600 pounds and fought the fish for over an hour before he finally broke off. I can still see that fish in my mind and to feel the pull of a really big fish is an adrenaline rush like no other." Throughout the year, Windley bases The Gulf Rascal out of St. Thomas, fishing local waters as well as Venezuela and the Dominican Republic. He typically spends 10 to 12 weeks a year fishing from April to September. In the year ahead, Windley plans to continue to base out of St. Thomas year-round. However, 2009 will see the launch of his new 68' Hatteras. "We have incorporated a lot of changes in the new boat to suit our fishing style," he says. Looking ahead, Windley says, "I think as fuel prices continue to climb and the economy weakens, we are going to see a downturn in the number of boats that make the trip down to St. Thomas and fish in tournaments. Circle hooks are here to stay and hopefully, tournaments will move away from killing billfish. To realize that 98 percent of the billfish population has been lost since the 1950's is unbelievable. One boat alone could easily catch 5 or 6 Granders off the coast of Peru in a single day and to think of days like that today is unimaginable." Gulf Rascal, the choice of knowledgeable observers!